This is the first article in the series of articles on Exception Handling in Sql Server. Below is the complete list of articles in this series. 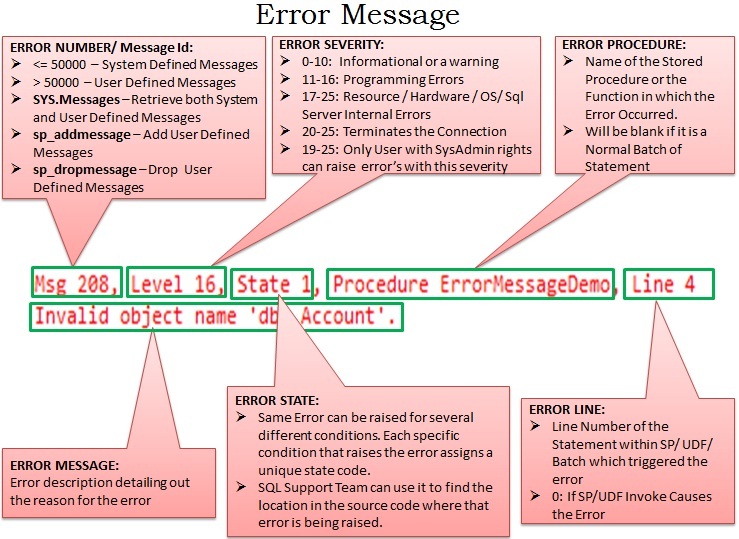 If we are not clear about the basics of Exception handling in Sql Server, then it is the most complex/confusing task, it will become nightmarish job to identify the actual error and the root cause of the unexpected results. In this blog post I will try to make sure that all the concepts are cleared properly and the one who goes through it should feel the sense of something they have learnt new and feel themselves an expert in this area. And at the end of the blog post will present the ideal exception handling template which one should be using for proper error handling in Sql Server. Let’s start with a simple statement like below which results in an exception as I am trying to access a non-existing table. If we compare this error message with the previous error message, then this message contains one extra part “Procedure ErrorMessageDemo“ specifying the name of the stored procedure in which the exception occurred. Any error number which is <= 50000 is a System Defined Messages and the ones which are > 50000 are User Defined Messages. SYS.Messages catalog view can be used to retrieve both System and User Defined Messages. We can add a user defined message using sp_addmessage and we can remove it using the system stored procedure sp_dropmessage. ERROR SEVERITY: Error Severity can be between 0-25. ERROR STATE: Same Error can be raised for several different conditions in the code. Each specific condition that raises the error assigns a unique state code. Also the SQL Support Team uses it to find the location in the source code where that error is being raised. ERROR PROCEDURE: Name of the Stored Procedure or the Function in which the Error Occurred. It Will be blank if it is a Normal Batch of Statement. ERROR LINE: Line Number of the Statement within SP/ UDF/ Batch which triggered the error. It will be 0 If SP/UDF Invoke Causes the Error. As the Account table has Primary Key on the AccountId column, so it will raise an error if we try to duplicate the AccountId column value. And the Balance column has a CHECK constraint Balance>=0, so it will raise an exception if the value of Balance is <0. Let us first check whether we are able to insert valid Account into the Account table. Now try to insert one more account whose AccountId is same as the one which we have just inserted above. Result: It fails with below error message, because we are trying to insert a duplicate value for the the Primary Key column AccountId. Violation of PRIMARY KEY constraint ‘PK__Account__349DA5A67ED5FC72’. Cannot insert duplicate key in object ‘dbo.Account’. The duplicate key value is (1). 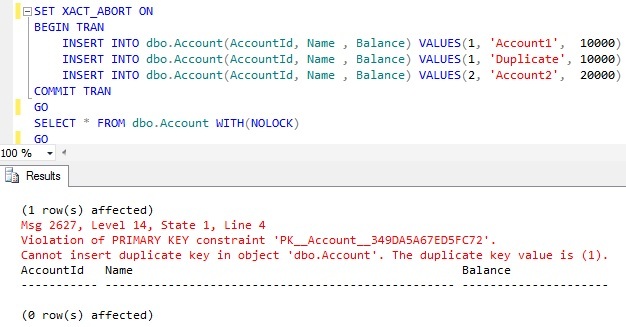 From the above example result it is clear that even though the Second insert statement is raising a primary key voilation error, Sql server continued the execution of the next statement and it has successfully inserted the Account with AccountId 2 by the third Insert statement. If Sql Server terminates the statement which raised the error but continues to execute the next statements in the Batch. Then such a behavior by a Sql Server in response to an error is called Statement Termination. 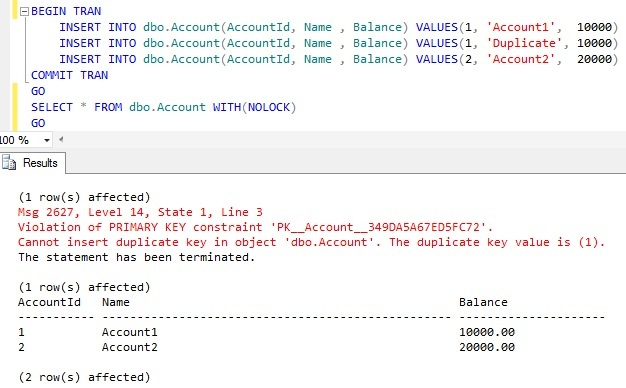 From the above example result it is clear that failure in the Second insert statement due to primary key violation caused Sql Server to terminate the execution of the Subsequent statements in the batch. 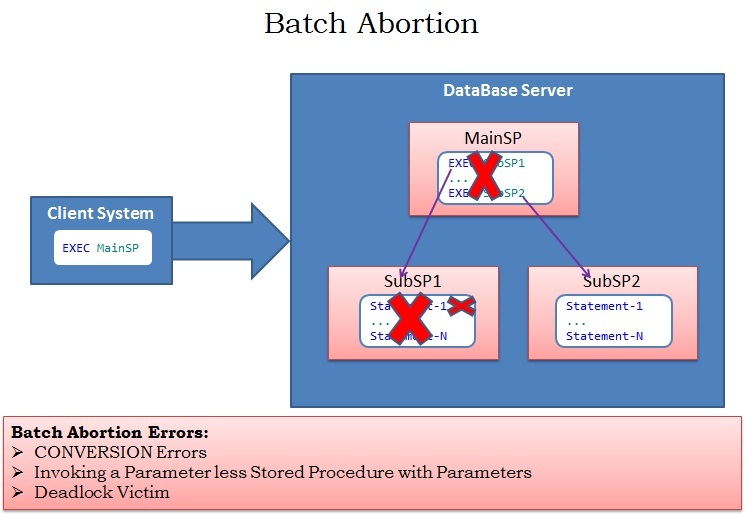 If Sql Server terminates the statement which raised the error and the subsequent statements in the batch then such behavior is termed as Batch Abortion. The Only difference in the DEMO 2 script from DEMO 1 is the additional first statement SET XACT_ABORT ON. So from the result it is clear that the SET XACT_ABORT ON statement is causing Sql Server to do the Batch Abortion for a Statement Termination Error. It means SET XACT_ABORT ON converts the Statement Terminating errors to the Batch Abortion errors. RESULT: Same as the DEMO 1, that is only the statement which raised the error is terminated but continues with the next statement in the batch. Here First and Third Inserts are Successful even though the Second statement raised the error. From the above example result it is clear that SET XACT_ABORT ON setting not only converts the Statement Termination Errors to the Batch Abortion Errors and also ROLLS BACK any active transactions started prior to the BATCH Abortion errors. DEMO 5: As a part of this DEMO we will verify what happens if a CONVERSION Error occurs within a batch of statement. From the above result it is clear that CONVERSION errors cause the BATCH abortion, i.e Sql Server terminates the statement which raised the error and the subsequent statements in the batch. Where as PRIMARY KEY violation was resulting in a Statement Termination as explained in the DEMO 1. From the above example result it is clear that CONVERSION errors results in a BATCH Abortion and BATCH Abortion errors ROLLS BACK any active transactions started prior to the BATCH Abortion error. If Sql Server terminates the statement which raised the error but continues to execute the next statements in the Batch. Then such a behavior by a Sql Server in response to an error is called Statement Termination. 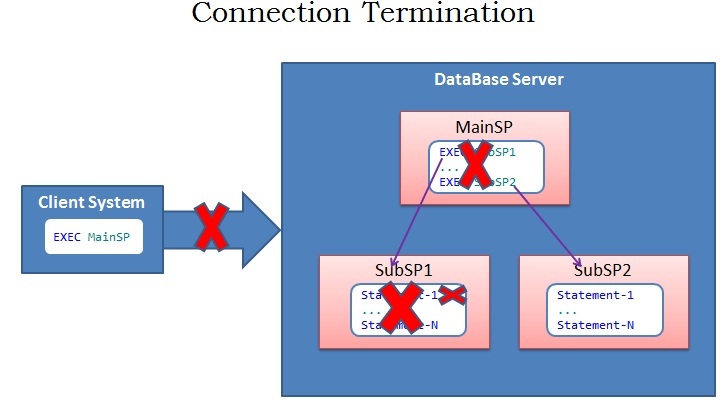 As shown in the below image the Statement-1 in SubSP1 is causing an error, in response to this Sql Server terminates only the statement that raised the error i.e. Statement-1 but continues executing subsequent statements in the SubSP1 and MainSP calls the subsequent SP SubSp2. If Sql Server terminates the statement which raised the error and the subsequent statements in the same scope, but continues to execute all the Statements outside the scope of the statement which raised the error. As shown in the below image the Statement-1 in SubSP1 is causing an error, in response to this Sql Server terminates not only the statement that raised the error i.e. Statement-1, but also terminates all the subsequent statements in the SubSP1, but continues executing further all the statements/Sub Sp’s (For Example SubSP2) in the MainSP. 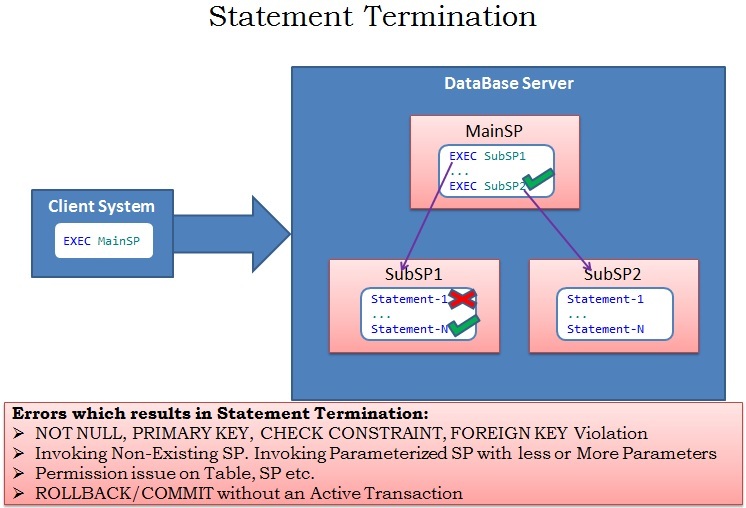 From the above SP execution results it is clear that the Access for a non existent table NonExistentTable from SubSP1 is not only terminating the statement which try’s to access this NonExistentTable table, but also the Subsequent statements in the SubSP1’s scope. But Sql Server continues with the execution of the subsequent statements which are present in the in the MainSP which has called this SubSP1 and also the SubSP2 is called from the MainSP. If Sql Server terminates the statement which raised the error and the subsequent statements in the batch then such behavior is termed as Batch Abortion. 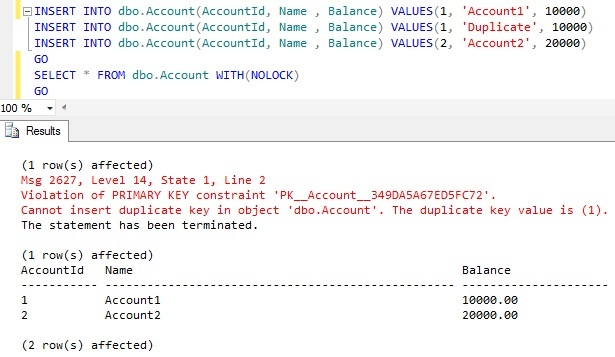 As shown in the below image the Statement-1 in SubSP1 is causing an error, in response to this Sql Server terminates not only the statement that raised the error i.e. Statement-1, but also terminates all the subsequent statements in the SubSP1 and it will not execute the further statements/Sub Sp’s (For Example SubSP2) in the MainSP. Batch Abortion Errors ROLLS BACK any active transactions started prior to the statement which causes BATCH Abortion error. 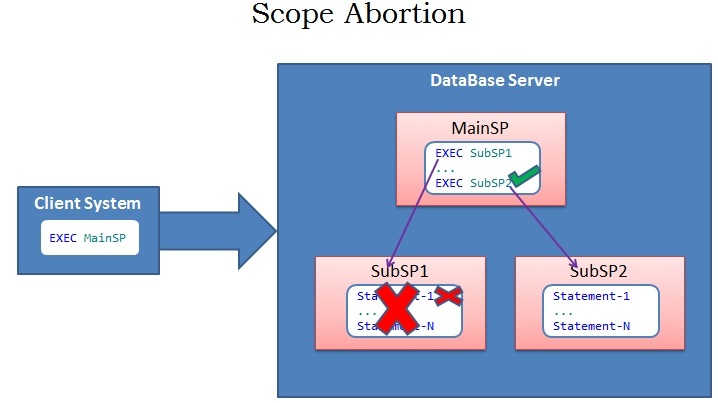 From the above SP execution results it is clear that the CONVERSION/CAST statement in the SubSP1 is causing the Batch Abortion.It is not only terminating the statement which raised the error but all the subsequent statement in the SubSP1 and the further statement in the MainSP which has called this SubSP1 and also the SubSP2 is not called from the MainSP post this error. Errors with severity level 20-25 causes the Connection Termination. Only User with SysAdmin rights can raise error’s with these severity levels. As shown in the below image the Statement-1 in SubSP1 is causing an error with severity 20-25, in response to this Sql Server terminates not only the statement that raised the error i.e. Statement-1, but also terminates all the subsequent statements in the SubSP1 and it will not execute the further statements/Sub Sp’s (For Example SubSP2) in the MainSP. And finally terminates the connection. 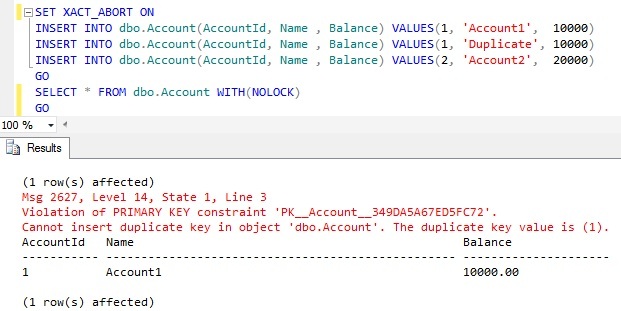 Note if there are any active Transactions which are started prior to the statement which caused the Connection Termination error, then Sql Server Takes care of Rolling Back all such transactions. Below query gives the list of Error’s that cause the Connection Termination. Let us know your feedback on this post, hope you have learnt something new. Please correct me if there are any mistakes in this post, so that I can correct it and share with the community. I think you should give more information about the Scope abortion. Although it looks similar to a Batch abortion, it seems that when a transaction is added, its behavior is similar to the Statement abortion – the transaction is not being rolled back implicitly, unless a ‘SET XACT_ABORT ON’ was declared. Also, you listed the ‘Trying to access a non existent table’ under the batch abortion errors list, while, according to your example, it should be under a scope abortion error list (which doesn’t exist at all). Where did you get the list of the different errors per abortion types? Does Microsoft have any documents about it? Thanks AP for taking your valuable time and pointing out your observations. I have correctedthe Batch Abortion Image. Basically, I took couple of error messages from sys.message and tried to simulate these errors and observed how sql server behaves. Based on this experiment classified and presented here. Whenever I get time will experiment few more common errors and classify them accordingly and also will include few more examples for scope abortion. Very much clear after looking into this article.. Thanks you very much for sharing the information..Excellent .. hope you post more articles like this. while browsing, I found this article and i start reading casually for basic info. But you provide the info which is awesome.I could n’t go out without leaving a comment for you.. Thanks, really clear things for me. Great Article. Great explanation, and helpful examples. Thanks for posting this series – I’m going to share with my team. At the start you presented a session on this topic at Microsoft Office in the Sql Bangalore User Group meeting and got appreciation. You really deserve it. Nice article ever read on Error. Thank you for sharing. Sir Could Explain what is query Optimization ? and how can do this.